This proposal includes three parts: residence, golf course, clubs, which need to be carefully studied and eventually integrated into an organic whole, forming a unified coordinating system. From small scale, detailed level of materials and construction and to large scale of lighting, traffic and public space, it includes all of them. The overall planning proposal of this project: the basic planning goal is to make full use of lands for construction of golf course and real estate. In order to better identify these blocks of land for golf courses, designers establish respectively the corresponding index system. These systems based on internal logic will have relevant and different effect on the evaluation of the golf course and high-grade residential area. An index system is set up by defining the possible area which is suitable for the construction of golf course and residential area. The purpose is to reflect the core constraints and opportunities of this area. In terms of residential building part, we distribute the residential area according to the different slope. The area is set for villa area, where the land gradient is less than 25 degrees; gradient of area between 25 and 45 degrees is for conjoined villa area; gradient of area more than 45 degrees is for villa and apartment area. Housing area follows the certain direction; basically it’s the east-west direction. We will build a pedestrian street and a sightseeing belt without the interference of architecture by later artificial processing. Designers add public facilities in north area, and connect closely golf course and residential area. The designers create the golf course's unique temperament and charm by using the fusion between nature and culture. Based on the rational use of existing resources in the field, designers add some humanities into stadium. For example: we match the dark stone with artificial bamboo, make the field full of natural vitality, and also facilitate materials and constructions. Landscape belt is divided into residential area and golf course, it is also an important part of the internal system of the project, such as drainage system, for example, public rest area of the stadium. These landscapes provide the golf course with design logic, and add to charm in it. 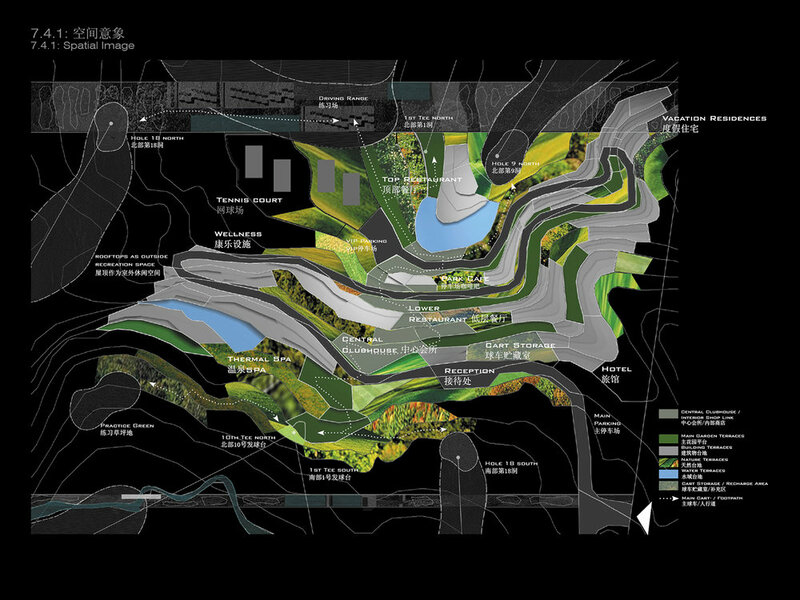 In the planning of golf course, designers use the landscape diversity, and extend it vertically to the entire hillside, conveniently connect each important part of the golf course. Architecture expression of the whole area is closely related to the traditional platform form. This type of traditional platform form not only exists in this area, also exists in the whole plot. The tracks of topography improve the quality of the natural mountains, provide internal and external space, natural slope and artificial platform, building, gardens, green land, water and channels. In addition, the garden terraces, architecture, natural park platform, and street, these thoughts following the natural and humanistic fusion are combined organically. These elements interact with each other, making the stadium become a panoramic view with distinct personality and unified temperament.